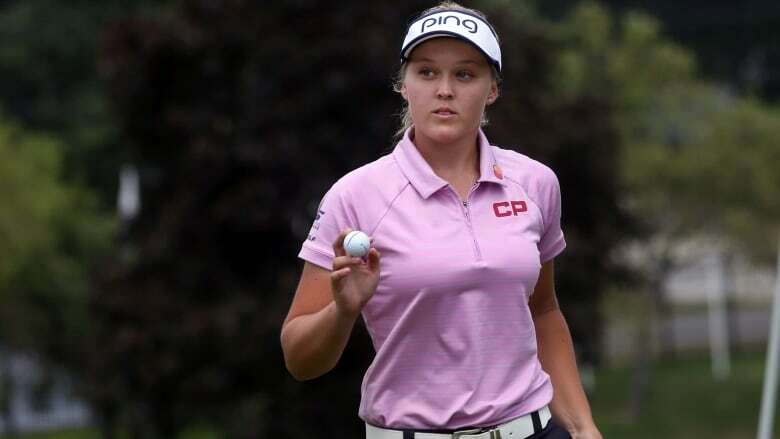 Canada's Brooke Henderson finished strong to card a 2-under-par 69 on Saturday and claim a one-stroke lead over the field through three rounds of the LPGA Marathon Classic in Sylvania, Ohio. Canada's Brooke Henderson is heading into the final round of the LPGA Tour's Marathon Classic with sole possession of the lead. The 20-year-old from Smiths Falls, Ont., shot a 2-under 69 Saturday for an 11 under total through 54 holes and a one-stroke advantage over Americans Angela Stanford and Brittany Lincicome. Henderson, who entered the third round tied for the lead with Sweden's Caroline Hedwall at 9 under, fired five birdies to help even out an up-and-down round that also featured three bogeys. Henderson, who birdied the 17th to take sole possession of the lead, admitted she was disappointed with her play on Saturday. "I made some birdies but I made some bogeys. I didn't hit it how I normally hit it, so I kind of grinded it out as best I could, and that's good," she said. "That's a good sign when you can still shoot under par and not hit it very well. Just going into tomorrow trying to get back to the way I normally strike it, and hopefully make a lot of birdies." Stanford tied the best score of the day at 65 while Lincicome shot 67. Hedwall dipped into a tie for 21st place with a 74. Seeking her first win since 2012, Stanford has shot back-to-back 65s after an opening-round 73. She credited a hot putter for her surge. "I think that's kind of what's kept me in it," Stanford said. "I'm seeing the lines pretty well. I didn't have the speed the first day. I didn't have it at all. I kind of figured it out the last two days." Lincicome had a 4-under 67, including birdies on two of the final three holes. In 10 previous Marathon Classics, her best finish was a tie for seventh in 2008. "This golf course is sneaky tight," said the big-hitting Lincicome, who is also seeking her second victory of the season. "I don't get to hit very many drivers, but even the 3-woods and the hybrids off the tee, you have to keep it in play, and there are a few holes out there that I just pray I get through with a par, and we try to birdie the others." Brittany Marchand (70) of Orangeville, Ont., was six shots back of Henderson in a tie for 30th place. Hamilton's Alena Sharp (71) was 11 shots off the pace. Henderson has six LPGA Tour victories, including the Lotte Championship earlier this season. She is two victories away from tying Sandra Post's record eight by a Canadian woman. This is the fifth time in Henderson's career she has held the 54-hole lead. She went on to win on three of the four prior occasions. "It's going to take a really good score," Henderson said of Sunday's challenge. "Lot of people shot minus-6, minus-5 today. So I would imagine something close to that tomorrow would do the job." A win, worth $240,000 US, would vault Henderson into second on the LPGA money list this year. Henderson is looking to become just the third player to win multiple events on the LPGA Tour this year. "This week, things have been clicking for me a little bit better than normal," she said after her round. "I'm just excited to see my name at the top of the leaderboard. I would have liked to have played a little better today, but I'm happy to still be in the top spot and hopefully make a lot of birdies tomorrow." With a crowded leaderboard behind her, Henderson expects plenty of competition for the top spot on Sunday. "Hopefully my putter is really hot tomorrow," she said. "It's going to take a really good score to win."